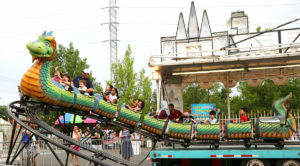 Kids of all ages enjoy a dragon ride (above) while teens wait for takeoff on a ride at Viva! Vienna (below). 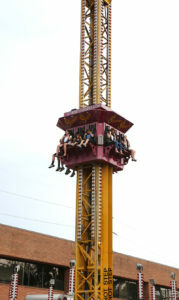 There was a little something for everyone to enjoy at Viva! Vienna! over the weekend. 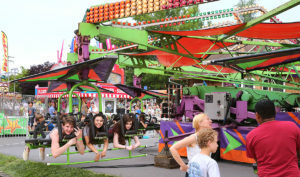 Rides, games of chance, entertainment, craft booths and a Hunter Mill Democrats’ booth, where volunteers encouraged people to register to vote and sign up to volunteer. The annual Memorial Day celebration and remembrance was held Saturday, Sunday and Monday on Church Street in the heart of Vienna, near the historic Freeman House and the Old Vienna Railroad Station. 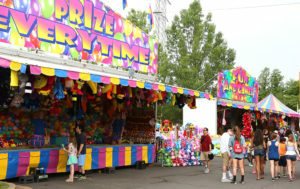 Visitors were treated to more than 100 vendors and local artisans, amusement rides and food from local restaurants. Each day featured entertainment from local bands and dancers. Hosted by the Rotary Club of Vienna, all profits are donated to charitable, community and humanitarian organizations. 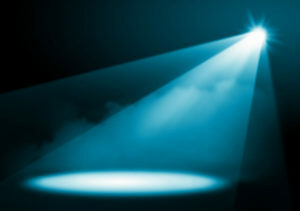 Games of chance promised a prize for everyone. Going up the tower fall. 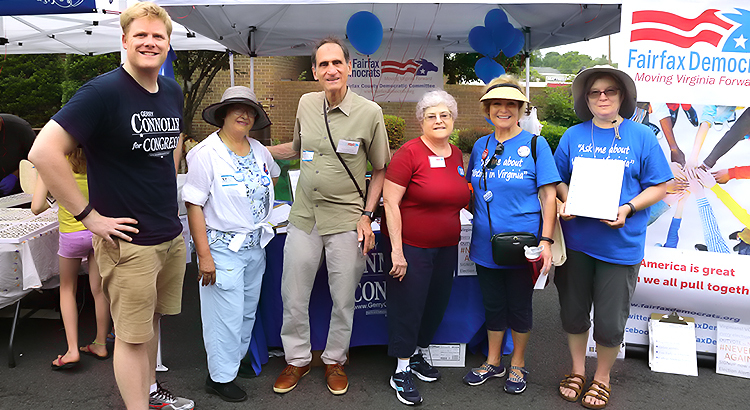 Photo above the story is of Democrat volunteers Donald Brownlee (left), Sue Langley, Phil Haber, Sherry Olstein, Karen Gatz and Liane Paulson.